I saw this post from Alan Green in Google+, and then I noticed the new options. The available options are the same: Comfortable, Cozy and Compact, as well as the functionality. 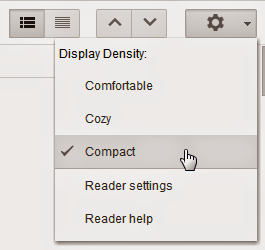 You might not notice any difference between the first two, since they are designed primarily for large and very large screens, but ‘Compact’ is very useful, especially if you are predominantly using ‘list view’, like me. Unfortunately, the double header – one for the logo and search box and the second one for subscribing and action buttons – is still taking up a lot of space and choosing ‘Compact’ doesn’t have much impact on this region. I will be trying to adjust my own user style for the change shortly – it’s probably just a matter of removing some of the lines affecting spacing for the feed items. Another thing I noticed a couple of days ago is that the Google Dashboard still links to your Google Reader shared items and to the list of people you followed there, although there’s no way to know how long they will still be up. Both open in the usual interface, so you can still browse your past shared items, bookmark them for example, or look up the Google profiles of the people you used to follow to connect with them on other networks.